After a very volatile late-February followed by several sharp mid-March downturns, gold and silver prices settled down for a brief period as the gold-to-silver ratio stabilized near historical norms in mid-April. Comex gold has traded range-bound between its April highs and lows of $1,685.40 and $1,613 per ounce and closed Friday at $1,645.20, very near the middle of its trading range. In striking contrast, Comex silver intraday prices touched 16-week lows before edging back above $30 per ounce level to close at $30.43. Are gold and silver parting ways? Tracking the gold-to-silver ratio (GSR) can answer this question and provide clues as to what may lay ahead for the precious metal pair. Figure 1 is a 6-month chart of the GSR from late-October 2011 to the April 27 close. 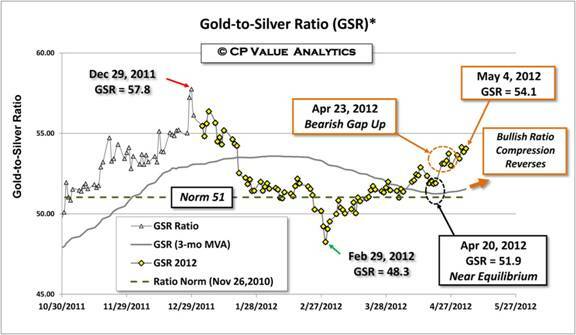 The bullish compression of the late-2011 GSR (gray triangles) to present levels (2012 yellow diamonds) has reversed with the 3-month moving average (gray line) pulling away from the ratio norm of 51 (dotted line) with positive slope (orange arrow) - a rising ratio denotes silver losing price strength relative to gold. This analysis uses Nov. 26, 2010 to define the norm because that date marked a period when not only gold-to-silver but gold-to-copper and –oil ratios returned to stable near historical averages after the extreme volatility of the 2008-2009 financial crisis. To understand the white metal reversal it is instructive to look at the close on April 20. On that Friday, the GSR settled at 51.9; a 10% compression from the bearish 57.8 at the close of last year. The GSR had trended up on a day-to-day basis from the Feb. 29 low of 48.3 and was converging on the norm and three-month average. When the daily ratio, moving average and norm converge with a high degree of ratio stability, gold and silver prices are considered at equilibrium. * Stability is defined as the standard deviation of the ratio normalized by its mean over the specified periods. 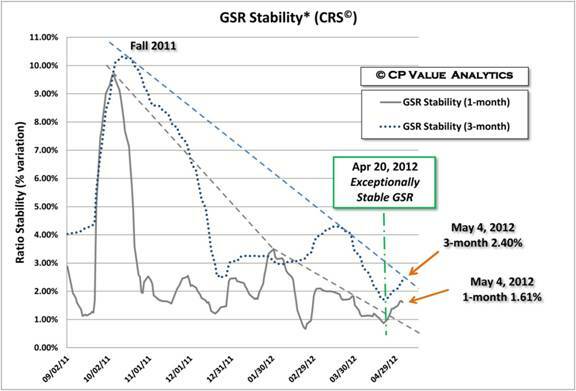 * Stability variations (gray diamonds) of less than 3% are considered “very stable.” If the 1-month CRS is below this level (vertical line & gray arrow), the GSR is considered very stable on a short-term basis. Similarly, a 3-month a CRS less than 3% demonstrates excellent mid-term stability (horizontal line & purple arrow). Bearish divergence occurs when the CRS moves significantly above 4%. The time history of Figure 2 illustrates that both the short-term (gray line) and mid-term (dotted blue line) GSR stability have been improving from a very unstable period last fall marked by volatile prices swings for both gold and silver. Ratio stability variations less than 3% are considered very stable; in early-October 2011 variations greater than 9% indicated extreme divergence of the GSR. The 1-month and 3-month stabilities were less than 2% on April 20 (0.87% and 1.71% respectively), so it is true that gold and silver were exceptionally stable and near price equilibrium (Figure 1, black dotted ellipse). Markets teach us that relative price equilibrium is typically a rare and fleeting event – not unlike a solar eclipse. April 20 was no exception as the 1-month and 3-month stabilities bounced to 1.61% and 2.40% by May 4. Importantly, both measures were below their upper-trend boundaries on April 20 as shown by the dashed straight lines; on April 27, the 1-month stability broke trend to the upside and the 3-month is very close to doing the same. Figure 3 illustrates this change of state much more dramatically. 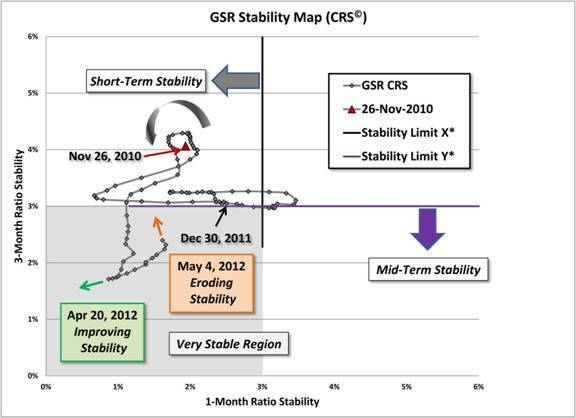 The GSR 2012 stability trajectory (gray diamonds and lines) had lassoed the “normal” point defined for Nov. 26, 2010 (large gray arrow encircling the red triangle). The trajectory then dropped into the “very stable region” (shaded gray area) with vertically descending conviction. By April 20 the trajectory direction suggested even greater stability improvement was possible (green arrow). On the following Monday, April 23, the GSR made a bearish gap up above 53 (Figure 1, orange dotted ellipse) and the ratio has remained above these levels ever since. Figure 3 shows this move as a complete flip in direction of the stability trajectory resulting in a bearish path up that indicates eroding stability (orange arrow). As reported by Kitco News on April 27, TD Securities made a prescient warning that its outlook for the silver market was negative near-term and suggested that the headwinds of a recessionary Europe, softening Chinese demand, fading investor interest and high inventories could return the white metal to $29 per ounce. Last Friday, silver prices did indeed dip briefly below $30 per ounce. The above analysis demonstrates that silver and gold have moved rather abruptly from a point of relative price equilibrium to an elevated ratio presently above 54 - silver price strength relative to gold is in decline. If the ratio were to rise to the 57 levels of late-2011 and gold tests its April low, silver could easily return to $28 per ounce territory (i.e. $1,613 per ounce/57 = $28.3 per pounce). However, GSR stabilities remain “very stable” so it is unlikely that silver prices are on the verge of crashing as in 2011. My view is that precious and base metals should enjoy a better second than first-half for 2012 and TD Securities turns bullish on silver in the next three quarters. For the time being it appears gold and silver have parted ways. In any case, Commodity Ratio Stability© analysis offers a powerful technique to track the next wiggle in their relative performance.